Notes: This compact unit provides a polished, recordable sound with 8W output through the 6.5" speaker. For production quality on the move, the Mini Rock Station can be operated from battery power and can even hang from a shoulder strap. Incredible flexibility is afforded by this little amp for a near limitless variety of situations. This compact unit provides a polished, recordable sound with 8W output through the 6.5" speaker. For production quality on the move, the Mini Rock Station can be operated from battery power and can even hang from a shoulder strap. Incredible flexibility is afforded by this little amp for a near limitless variety of situations. Notes: iRig Micro Amp is a compact, battery-powered amp that lets you do more. At 15W RMS, it's louder than you'd expect and covers a range of tones, with 3 custom-voiced analogue channels: clean, drive, and lead. Plus, iRig Micro Amp's connection lets you plug into all your favourite apps and software. Learn new songs, practice your favourite licks, perform with backing tracks, and even record your own songs easier than you ever imagined. All this in an ultra-compact size that's easy to carry anywhere. With iRig Micro Amp you'll never stop finding ways to take your playing further. iRig Micro Amp offers 15W power when plugged in, and 7.5W when running on 6 x AA batteries. Combined with a 4" custom-voiced speaker, it pumps out surprising volume at half the size of similarly-powered amps. So it's perfect for everything from a bedroom or desktop, to jamming with friends or street busking. It offers 3 analogue channels: clean, drive and lead, with the rich, warm sound you'd expect from the tone gurus behind AmpliTube. You get low, mid and high tone controls, plus adjustable gain, to easily dial in nearly any sound. Need more volume or a bigger speaker? 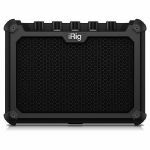 iRig Micro Amp also offers a cabinet output, so it can keep up with a full drum kit for band practice. An aux input lets you connect any analogue input, like an MP3 player, to jam along, and a headphone output is perfect for silent practice. iRig Micro Amp also connects to your iPhone, iPad, Mac and PC, routing your guitar's signal to your device to process or record, and plays back directly through the 4" speaker. It's an entire setup in a single integrated unit derived from IK's award-winning iRig HD 2 mobile guitar interface, with 24-bit, 96 kHz for pristine sound quality. With the included AmpliTube app and software, Micro Amp delivers the widest range of tones and a level of accuracy you've never heard in a practice amp before. iRig Micro Amp unlocks 10 amps and 26 stompbox effects in AmpliTube CS for iPhone or iPad, and includes AmpliTube 4 for Mac/PC for 9 amps and 10 stomps. Right out of the box you can enjoy everything from vintage twang to screaming high-gain, and all the tone-shaping pedals you'd want. You can easily expand your sonic collection with IK's range of additional amp and effect models - there are over 280 pieces to choose from, including officially licensed re-creations of gear from Fender, Orange, Mesa-Boogie and other iconic gear manufacturers, as well as guitar legends like Slash, Jimi Hendrix and Dimebag Darrell, all available a la carte. Beyond AmpliTube, iRig Micro Amp lets you connect to an endless array of apps and software. Learn new licks, polish your technique, or jam along with your favourite songs - iRig Micro Amp makes it easy and fun so you'll never get bored. iRig Micro Amp also makes it easy to start recording your own music. With apps like GarageBand, it's a cinch to capture your ideas or even record a full track. But Micro Amp also works with professional recording software like Logic, Pro Tools and more, creating a convenient desktop setup for use on the go. There's never been an amp that offers you this many ways to make music in a size you can carry anywhere. iRig Micro Amp really does let you take your playing further. Notes: What if you could carry in the palm of your hand a guitar amp that had access to virtually any guitar sound you can imagine? And what if you could drive a 4x12" cab with it with no additional gear needed? Now you can with the new iRig Nano Amp - the first micro guitar amp and interface for the mobile guitarist. iRig Nano Amp is a super-compact battery-powered self-contained micro amp and interface for iOS that you can use by itself, with headphones or even an external speaker cabinet - this power-packed amazing little amp can drive up to a 4x12" guitar cab! But what makes it more versatile than any other micro amp is that it features the iRig circuitry so you can plug your iPhone or iPad into it with the included TRRS cable and tap into the limitless world of AmpliTube guitar tone and more on your iPhone and iPad. What makes iRig Nano Amp so unique is that you can operate it in two different modes: AMP & DEVICE. In AMP mode it's a standalone amp for impromptu practice anywhere. In DEVICE mode you use it as an interface and amp for your iOS device. Plus, in both modes you can use the built-in speaker or hook up an external speaker cabinet - up to a 4x12" cab - for more volume and tonal clarity. iRig Nano Amp is the most versatile, feature rich micro amp in the market and provides you with outstanding value and performance. iRig Nano Amp is also an interface and output for your iOS device thanks to its integrated iRig circuit. Use the included TRRS cable to hook iRig Nano Amp in DEVICE mode to your iPhone or iPad and plug in to the amazing toneful world of AmpliTube - the ultimate guitar and bass tone studio - to play, practice and record anywhere, any time. This is great for grabbing ideas in the AmpliTube 4-track looper or recording studio, or just practicing with your favourite AmpliTube gear and more. When used in DEVICE mode, the internal tone stack circuit is bypassed and the volume knob controls the overall output of the amp. This lets you hear only the processed signal coming from your iOS device with no additional amp coloration. Also in DEVICE mode, the 1/8" headphone jack is active so you can play/record in the privacy of your own headspace. 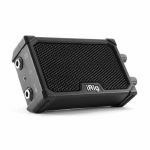 iRig Nano Amp features a 1/4" speaker out jack that - get this - can drive up to a 4x12" cabinet. When you plug in, you'll be floored by the volume and tonal definition that iRig Nano Amp provides. You can connect an external cab in both AMP and DEVICE modes giving you the most flexibility of any "micro" amp out there. iRig Nano Amp is compact - it's just slightly larger than an iPhone, fits in any gig bag or the palm of your hand and features a handy "kickstand" for tilting back the unit for better monitoring. Inside, iRig Nano Amp powers a 3" speaker with a 3-watt class A/B power amp. When in Amp mode, you set your overall output volume with the volume control, then dial in just the right amount of saturation and distortion for your playing pleasure. 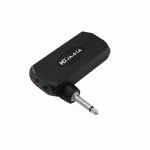 iRig Nano Amp features a 1/4" guitar input, a 1/4" speaker output, an 1/8" headphone jack, is powered by 3 AA batteries (included) and comes complete with a TRRS cable for connection to an iOS device. It can be used with 3 output monitoring options - with headphones for private practice and recording in DEVICE mode, and with the internal speaker active, or with an external speaker cabinet connected to the 1/4" speaker out in both DEVICE and AMP modes. When used with headphones or an external cab, the internal speaker can be muted with the volume control knob. iRig Nano Amp features the famous iRig analogue interface circuit for iOS. This means you can use iRig Nano Amp to connect your guitar to your iOS device with the included TRRS cable and tap into the tones of AmpliTube iOS - the leading guitar tone studio app featuring gear from the world's top manufacturers like Fender, Orange, MESA/Boogie and more! AmpliTube and iRig Nano Amp gives players a complete mobile tone and recording solution. 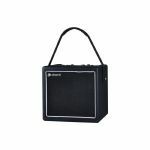 Notes: The Johnny Brook 20 Watt Amplifier is an ideal portable solution for any aspiring musician. It is suitable for most Electric and Electro Acoustic Guitars. This ultra-portable amplifier is big on features: includes Volume Control (treble and bass), (6.5in.) 20 Watt speaker, 6.35 mm Input and 6.35 mm Headphone Output. It can also be used as a music speaker for your MP3 player, phone or laptop. Notes: This 10-Watt, 1 x 6.5" combo's eye-catching looks are also classic VOX and include basket-weave, leather-look vinyl, our distinctive diamond grille cloth and, of course, chicken head knobs! Small but all-important details such as gold beading and white piping have also been faithfully reproduced, perfectly recapturing the legendary look of VOX. The Pathfinder 10's powerful yet always tone-filled 10-Watt output, makes this amp perfect for home practice, backstage warm-up and recording. The Clean/Overdrive switch allows you to change instantly between clean and dirty sounds. With a mere press of this switch you can go from a crystal clear clean sound to our uniquely warm distortion; or from a slightly crunchy bluesy tone to a high-gain, modern-rock roar. Want to practice late at night without disturbing your neighbours? No problem! Just plug your headphones into the Headphone/Line Out jack and away you go - your sleeping neighbours won't hear a thing because using this jack automatically mutes the amp's speaker! This jack also doubles as a specially filtered Line Out which is perfect for recording your amp without having to worry about setting up any pesky microphones. The Pathfinder 10 also features controls for Gain, Treble, Bass and Volume plus a Clean/Overdrive switch. This 10-Watt, 1 x 6.5" combo's eye-catching looks are also classic VOX and include basket-weave, leather-look vinyl, our distinctive diamond grille cloth and, of course, chicken head knobs! Small but all-important details such as gold beading and white piping have also been faithfully reproduced, perfectly recapturing the legendary look of VOX. Notes: The VX50 GTV was born from a desire to open up new possibilities for guitar amps. A design that's almost unreasonably lightweight, an internal structure carefully calculated for the optimal sound, realistic and stage-ready sounds driven by modelling technology, and the next-generation Nutube vacuum tube featured on the VX50 GTV are some of the many leading-edge specifications that make this a rediscovery of the guitar amp. Overturning existing ideas of guitar amps, the VX50 GTV will allow you to enjoy playing guitar in any musical scene. Thanks to their many years of developing modelling amps, VOX delivers the ultimate in sound. Proprietary VET (Virtual Element Technology) enables unprecedented realism, reproducing not only the audible result but rethinking the original circuit itself, painstakingly modelling even individual components that affect the sound. In addition to the classic AC30, this one unit covers a diverse multitude of sounds that include famous tube amps, modern high-gain amps, and rare boutique amps. Newly added is a LINE type which supports not only electric guitar but also acoustic guitar, further expanding this unit's usefulness. The stylishness that you expect from VOX is definitely inherited by these models as well. In addition to the complex three-dimensional design that is enabled by ABS unibody construction, it fuses a stone-coloured body with black-toned diamond grill cloth, achieving a subtle balance. Notes: Getting the band together or even practicing by yourself isn't always easy. Conflicting schedules, space restrictions, and perhaps most importantly, not bothering your family and neighbours, are just a few of the factors that can hijack a jam session. SesssionCake is the affordable, ultra-portable, and flexible solution for aspiring musicians who don't have the time, the money, or an appropriate space to really cut loose when they practice alone or jam with friends. Connect an iOS device as an effector or to play along with your favourite tunes, or link together up to eight units for a full-blown jam session with your friends or bandmates. No money, no time, no space? No problem-SessionCake has got you covered. No amp, no cabinet, no pedals... just a guitar or bass, some headphones, and SessionCake SC-01 are all you need for intensive individual practice or a full-blown rehearsal or jam session. Connect up to 8 SessionCakes together to create a fully featured mixing system where everyone can create the mix that works for them. Portable, lightweight, battery powered, and equipped with a Hi-Z input, the SC-01 also features an AUX-in port that allows you to use an iOS device as an effector, or play along with your music library.